The Catalyst is introducing a new column, in which the scholars of ASK are polled about various topics and the top five answers are expanded upon. The topic of discussion this week is Top Games. No matter what spectrum of the console war you are on, gamers have access to just about every type of game that exists. From MMOs, to board games, there is a large variety of genres to choose from, and this raises the question, what is the most played type of game among ASK Academy scholars? The Catalyst polled scholars at the school to find out what games the student body is playing. 5. Coming in fifth place are racing games. With 8 percent of the votes, these games put the player in a variety of situations where one must get to the finish before a number of rivals (both human and computer controlled racers). The difficulty level can be different from each racing game, some have intense difficulty like F-Zero, while other games are meant more to relax, such as the Mario Kart series. Whether you have a need for speed, or just needed something to do with your house guests, you might want to give one of the various racing game a try. 4. For as long as the human race has existed, we have challenged each other’s ability to think quickly. The majority of puzzle games are variations of the original Tetris, which is a game where one must drop blocks in order to fill rows to eliminate them without reaching the top. There are many other creative types of puzzle games. 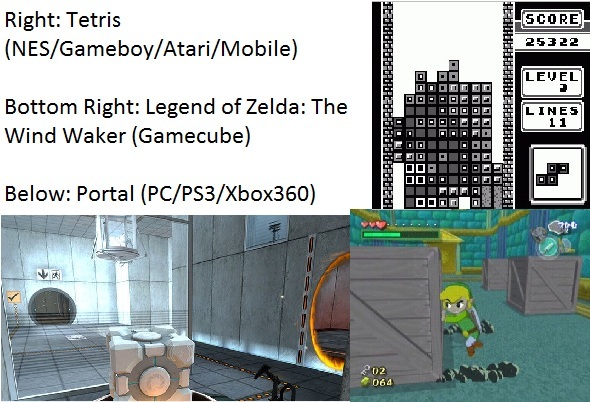 Examples include Portal 1 and 2, where players can experiment by placing two connected portals on any flat-white surface, players then use them to get to the end of each test chamber. If you want to test out your abilities to figure out solutions to many problems, then puzzle games are for you. 3. As Americans, we enjoy the freedoms we have, and sandbox games allow us to indulge our desires to create any world we wish. Games like Minecraft and Garry’s Mod give players the freedom to create anything they want. This was actually tied with 4th and fifth place, with 8 percent of the votes. Even if a certain feature is not in the game itself, there are player-made modifications that can be downloaded and added to the experience. If one wishes to create anything they can imagine, than sandbox games are the place for them. 2. Coming in second with 19 percent of the votes, we have first-person shooters. These games all use a similar type of game play, where players get a gun, and you shoot enemies to complete missions. There are various themes, such as futuristic themes such as Warframe, and Halo; there are also more modern ones such as Modern Warfare, and Black Ops. Some are realistic, and some are more fantasy. If you have the desire to be a soldier, but you don’t want to leave the comfort of your home, first-person shooter games are for you. 1. Last, but by no means least, the winner is Role Playing Games, or RPGs, with 35 percent of all the votes. They live up to their names by allowing you to play roles. These games vary immensely, from being a young child using baseball bats, and yoyos, to defend your home, to being a legendary hero wielding swords and magic. The way the combat flows in each one is different, Players can choose certain moves from a menu, or place your soldiers and watch the battle unfold. A large portion of RPGs are story along with gameplay, being as simple as wanting to become a Pokémon Master, to being an angel that falls from the sky and awakens with no wings or a halo. If you want a story along with strategic, laid back gameplay try out an RPG. For the next Asking ASK, The Catalyst would like to know “What is your favorite app?” This app can be for anything such as Android, IOS, Kindle, or Google Chrome. The only rule is that this app cannot be a game. Send your vote to vmangiacapra@theaskacademy.org, and check back to see if your favorite app makes it into the next column.